A summary rating of Tyrol is currently not possible. However, due to the size of the area, representative populations of typical species and bird communities of the high montane, subalpine and alpine levels are recorded. These include the grouse family (Tetraoninae). They are a subfamily of the pheasant family. These are northern hemisphere birds adapted to cold climates. Most species inhabit high-altitude regions or the high mountains. 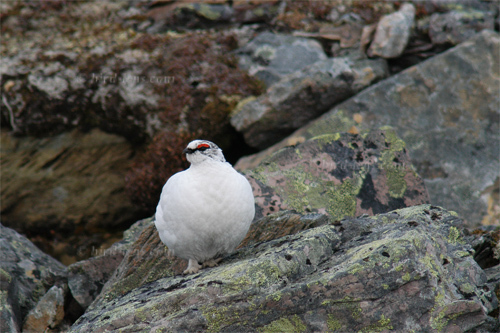 These include Capercaillie (Tetrao urogallus), Hazel Grouse (Bonasa bonasia), Black Grouse (Tetrao tetrix) and also the Rock Ptarmigan (Lagopus mutus). Tyrol, this small region in the heart of the Alps, consists of three parts: South Tyrol, North and East Tyrol. South Tyrol is located south of the main Alpine ridge and since 1919 on Italian territory. North Tyrol is the part of the country north of the main Alpine ridge, in the west of Austria between Salzburg and Vorarlberg. In the north, North Tyrol borders Bavaria, in the Reutte-Lechtal region of the Allgäu. In a small piece in the southwest, North Tyrol finally borders the Engadine in Switzerland. Tyrol is a land full of contrasts. Untouched mountain landscapes face man-made landscape. It is often only a few steps from the village or out of town to nature. In the vicinity of intensively used areas you can find intact habitats with a diverse flora and fauna. These contrasts span the entire country. Especially in the larger valleys and in the touristy areas one senses these contrasts very intensively. Roads cut across forests, ski-tracks cut through habitats, highways and streams and rivers squeezed into tight corsets become insurmountable obstacles for many creatures. The landscape photographer should take Tyrol with ease. The spectacular scenery of the mountains and the numerous picturesque high valleys and mountain lakes offer rewarding motives in large numbers. The best season to get stunning landscape photos is autumn. On the one hand there is usually a stable weather situation at this time of the year and on the other hand the autumn coloring enchants with its colorful palette of colors the landscape. Tyrol, this small alpine region, offers numerous worthwhile photo targets, especially if you are ready to take on physical hardships. The best way to photograph successfully in the mountains of Tyrol is to rent one of the many Alpine Club huts and take a photo tour from there. The homepage of the Austrian Alps Association provides information about the location, the time of ascent, opening hours and telephone numbers of the many huts in Tyrol. Staying overnight on the shelters has several advantages: On the one hand, this saves you the tedious climb long before sunrise or even the descent into the valley after sunset. Most of the cabins are located in spectacular landscapes and especially the early morning hours and the sunset in the mountains are captivating with unique light situations that make many photographers yodel. In East Tyrol, the Hohe Tauern National Park is one of our most popular photography destinations. On the one hand the park impresses with its spectacular landscapes and on the other hand with its great wealth of various and also rare animal species such as the Bearded Vulture (Gypaetus barbatus), also known as the Lämmergeier. Highly recommended is the hike around one of the highest mountains in Austria – the Grossglockner – on the Glockner trek. However, this multi-day hike requires a lot of fitness and mountain experience. In addition to the Hohe Tauern National Park, a visit the Karwendel Mountains in North Tyrol is highly recommended. In 1928, most of the rugged Karwendel was declared a nature reserve; today it is called Alpenpark Karwendel. With 11 combined protected areas, the area reaches a size of 730 square kilometers, making it one of the largest preserved natural landscapes in Central Europe. To cope with the growing demand for top shots of the rarer species of the Palearctic Bird-Lens is keen to enrich the range of pictures of birds you can find in the western Palearctic. Trips to remote places like this one to capture images of rare birds of western palearctic were very successful. The nice image of the blog is only a first impression, what you will find in the gallery in the “Picture Shop” very soon. Just give bird-lens.com a message, if I could serve you with an image needed before the new pictures are online.